Construction soon will begin on a nine-story apartment building at 301 N. Pennsylvania St., the plot of land left vacant when The Indianapolis Star moved its operations 2½ years ago, the newspaper has reported. 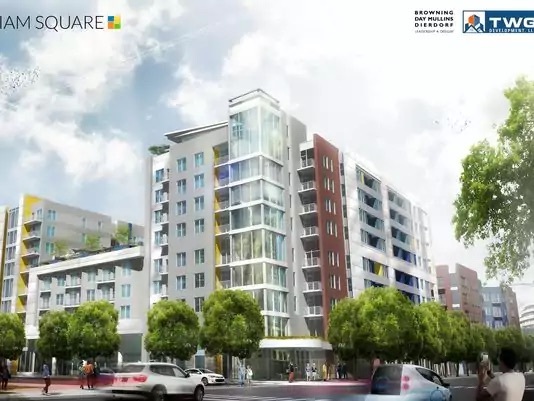 The 334-unit, $52.2 million Park at Pulliam Square is set to open by summer 2018, with 498-sq.ft. “micro-studios” starting at $920 a month up to the 2,732-sq.ft. penthouse for $5,000 a month. TWG Development purchased the four-acre property covering nearly a full city block at the southern mouth of Mass Ave. for $11.25 million in 2013. Originally, TWG planned to preserve most of the former building and renovate it into a $60 million complex with more than 300 apartments and 5,500 sq. ft. of retail space. But the building proved to be too difficult to convert. An amalgamation of five buildings constructed together, it had different levels that didn’t match, the newspaper reported. Demolition on the building began in May 2015, and it has been a vacant dirt lot since.